Mannagum Cottage is one of six cottages at King Parrot. All cottages are architecturally-designed and self contained. Set on 200 acres of prime Otways land and forest all cottages have fully equipped kitchens, lounge and dining areas, wood fires, LCD TV, DVD and CD players, and individual BBQ areas. The cottages vary in size accommodating between 2 to 14 guests. All beds are made with crisp white sheets and cosy doonas. For entertainment there is a salt water swimming pool, a games room with table tennis, fuse ball, air hockey, darts & board games plus a mini golf course. There is also a sports court for cricket, badminton and bocce. There is a magnificent bush walk to a small waterfall that runs beside Aquila Creek, which connects to additional Otway State Forest tracks. Our farm animals are very popular with children. Meet Coco and Gypsy, our friendly donkeys, Finta, Poncho & Cisco, the alpacas and Rocky ("the Rockstar"), the shetland pony. Please access our website for more information about this cottage, other accommodation and our picturesque campground. If you wish to have a large celebration or get-together you may wish to book the whole property which accommodates up to 80 guests. Please give us a call to obtain a special rate. Please phone for special weekly rates. 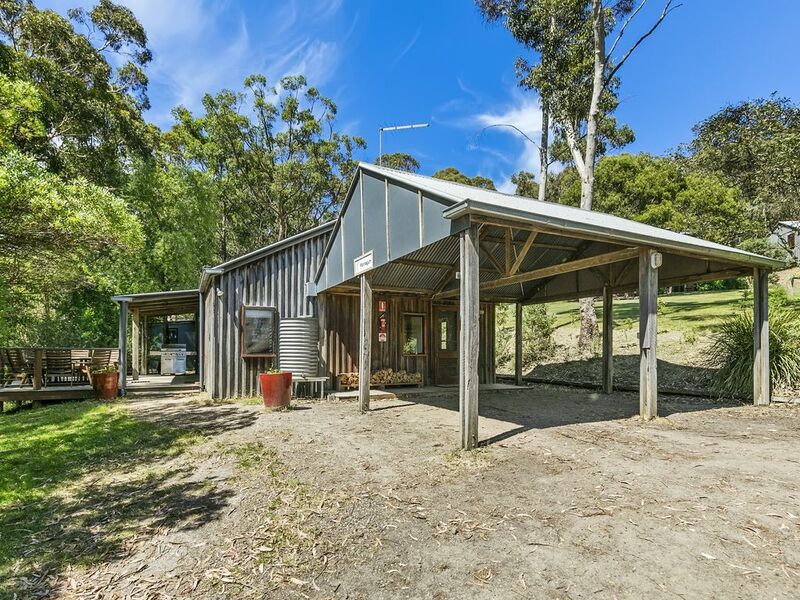 King Parrot Cottages is located in the picturesque Pennyroyal Valley near Deans Marsh in the Otway Ranges, a 90 minute drive from Melbourne CBD, 1 hour from Geelong and only 25 minutes from Lorne. We are a perfect base for your tour of the Great Ocean Road and the Otway hinterland. clean cottage. stunning location. vert relaxing weekend. The accommodation was perfect for a big family. We had a great time. A combination of interesting stuff for the kids and relaxing atmosphere for the adults. We loved our stay at your gorgeous property,the accommodation was excellent and the location made for a peaceful retreat from the bustle of the beach at the end of each day. The bush setting was magnificent and allowed us to share the region's natural beauty with our family visiting from overseas. The teenagers enjoyed the pool,minigolf and friendly animals. Our accommodation was comfortable and lovely in every way,catering very well for several family groups with plenty of dining and relaxing space. Thankyou for your friendly hospitality,Kristy and Robyn, we had a fabulous holiday! Thanks for a wonderful holiday! The family had an awesome time even with not so great weather! Plenty to do and see! Kids loved feeding the friendly parrots! Will definately be back! Thanks Kristy for your hospitality!The Gonczarek Family. We absolutely adored every minute of our stay in this accomodation and we will definitely be back again!